Many fiber optic applications, such as long-haul DWDM systems, require amplification of the optical signal. In the past, this entailed using expensive electronic repeaters at intermediate points every 100 km. Today’s modern long-haul DWDM systems use several advanced optical components to replace multiple repeaters with a single optical device. These optical devices which are called optical amplifiers, once only laboratory curiosities, now see widespread use in field deployments. One of the most common optical amplifiers is Erbium-doped Fiber Amplifier (EDFA). Researchers developed EDFA to replace numerous electronic repeaters with fewer optical repeaters, overall reducing system cost and complexity. EDFAs also allow simple system upgrades by adding additional sources to different wavelengths and combining them onto a single fiber using a DWDM multiplexer. The fiber used in an EDFA is doped with erbium, a rare earth element that has the appropriate energy levels in its atomic structure to amplify light at 1550 nm. A 980 nm or 1480 nm “pump” laser injects energy into the erbium-doped fiber. When a weak signal at 1550 nm enters the fiber, the light stimulates the erbium atoms to release their stored energy as additional 1550 nm light. This process continues as the signal passes down the fiber, growing stronger and stronger until it reaches the erbium-doped region. The figure below shows a two-stage EDFA with mid-stage acess, an important element of very high performance fiber optic systems. In this case, two simple single-stage EDFAs are packaged together. The user receives the output of the first stage EDFA and the input of the second stage EDFA. These systems often require the periodic use of additional elements, such as Dispersion-Compensating Fiber (DCF), in order to reduce the overall dispersion. A high insertion loss of 10 dB or more makes DCF problematic. Placing the DCF at the mid-stage access point of the two-stage EDFA reduces harmful effects on the system. The user still realizes significant gain through the EDFA, even with the additional of the high optical loss piece of DCF. In the figure, the optical input first passes through optical isolator #1, which onlu allows light to pass from left to right. Next the light passes through WDM #1. WDM #1 provides a means of injecting the 980 nm pump wavelength into the first length of erbium-doped fiber. WDM #1 also permits coupling the optical input signal into the erbium-doped fiber with minimal optical loss. The 980 nm energy pumps the erbium atoms into a slowly decaying, excited state. When light in the 1550 nm band travels through the erbium-doped fiber, which is usually tens of meters long, it causes the stimulated emission of radiation, much like a laser. In this way, the 1550 nm optical input signal gains strength. 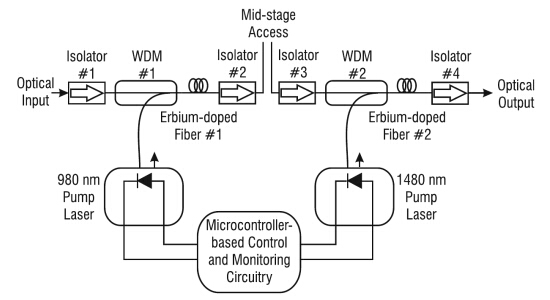 The output of the erbium-doped fiber then goes through optical isolator #2, which becomes available to the user. Typically, the mid-stage acess point connects to some sort of dispersion compensating device. The light then travels through isolator #3 and the WDM #2. WDM #2 couples 1480 nm energy from a second pump laser into the other end of a second length of erbium-doped fiber, increasing gain and output power. Finally the light travels through isolator #4. EDFAs avoid most active components because photons amplify the signal. The EDFA provides a high output power, requiring fewer amplifiers in a given system design. The most basic EDFA design amplifiers light over a fairly narrow band: 12 nm. The addition of gain equalization filters can increase the band to more than 25 nm. Other exotic doped fibers increase the amplification band to 40 nm or more. Furthermore, data rate independence in EDFAs means a system upgrade requires changing only the launch and receive terminals. 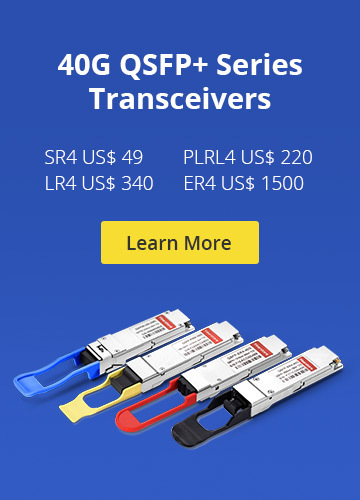 The EDFA’s reliable performance makes it useful in long-haul, high data rate fiber optic communications systems and CATV delivery systems. 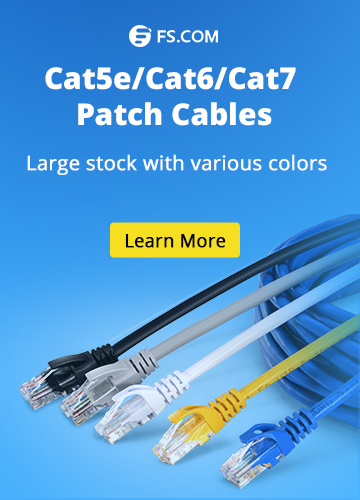 In CATV applications, EDFAs boost the signal before and after an optical splitter to amplify the split signal for transmission over several fibers. View the CATV amplifier product details here. In general, four major applications exist for optical amplifiers: power amplifier/booster, in-line amplifier, pre-amplifier or loss compensations for optical networks. 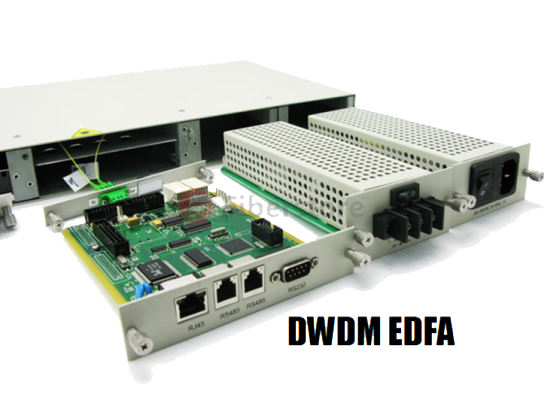 Optical Amplifier CATV amplifier, EDFA, optical amplifiers. permalink.